It's that time of year, when the green leaves fade to brown and the weather starts to cool down. Now is the time when hookah enthusiasts lock away all their cool summer flavors and begin busting out the warm, spicy flavors of the Autumn season. Luckily, we have made a nice little guide for mixing the ultimate Autumn blends to go with your Pumpkin Spice Latte, Pumpkin Spice Pie, Pumpkin bread, Pumpkin Spice Oreos, Pumpkin Spice french fries, and whatever other Pumpkin Spice consumables you may enjoy for the season. Just like last year, Fantasia Pumpkin Spice takes the reigns as the most popular pumpkin flavor on the market. During the Autumn season here, Pumpkin Spice shisha sells out incredibly fast (along with every other pumpkin spice thing ever), so be sure to pick up a couple hundred grams before it's all sold out. If Pumpkin Spice is a little too heavy on the spice for you, maybe try out some Starbuzz Pumpkin Pie. 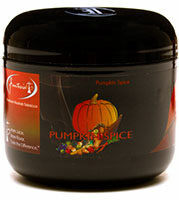 This flavor is a combination of pumpkin with clove and carries with it a lighter spice than that of Fantasia. This flavor is one of the newest flavors from Nirvana, and immediately upon first tasting this blend we deemed it worthy of being a terrific Autumn flavor. This cinnamon-honey-cream flavor is warm and delicious on its own, but also would make a delectable "topping" for a full Pumpkin Spice blend. Sweet. Spicy. Delicious. 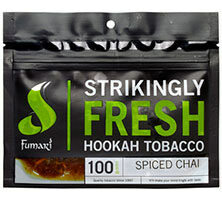 Fumari Spiced Chai is an incredible flavor, not only for Autumn, but just in general. All the spices, cinnamons and nutmeg flavors that radiate from this tobacco is just a certain necessity for smoking fall flavors. This mind-melting mix is just awesome. If you like purely warm, sweet and spicy blends, definitely pick this mix up right now! If Autumn was a flavor, this mix would be it.